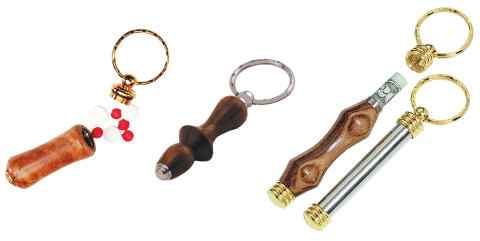 The 24K Key Ring and Brushed Satin Key Ring, along with the Detachable, Whistle, and Mini Pen Key Ring kits all require a 7mm drill bit and can be turned using our Std. Pen Mandrel. No additional bushings are required. The Secret Compartment Pill Box Key Ring requires a 9/16" Drill Bit and Secret Pill Box bushings. The Secret Compartment Key Ring, and the Mini Screwdriver Key Ring require a 10mm Drill Bit and Traditional 10mm Bushings.